Cuban-Canadian Elmer Ferrer is widely recognized as one of the world`s premiere guitarists. An extremely versatile and prolific session musician, Elmer has recorded and toured the globe with many of Cuba’s top producers and artists. 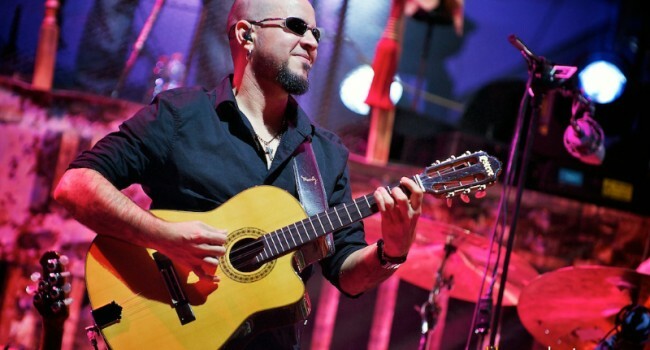 As a producer, arranger, session acoustic or electric guitarist, Ferrer has contributed to more than 100 music recordings, including two Latin Grammy nominee albums, a Goya awarded movie soundtrack, and recently, the latest CD from Italian superstar Zucchero, “La Sesion Cubana”. Elmer also has an established career as a composer and solo performer. He is a two-time Cubadisco* awarded artist, and is leader of the Elmer Ferrer Band (EFB). Known for captivating audiences and critics alike, the EFB has headlined international jazz, blues and music festivals, and shared stage line-ups with Keb Mo, Johnny Lang, Bonnie Raitt, Van Morrison, Kid Rock, the Chris Duarte Group, Los Lobos and the Derek Trucks Band. Elmer Ferrer currently resides in Toronto Canada, but his Cuban roots formed the foundation of his energy rich blend of Jazz, Rock, and Blues. He was born into a musical family in Sancti Spíritus, a small city that holds one of the strongest histories in Cuban traditional music. He started to play and study guitar at the age of 12, and graduated Classical Guitar at the prestigious National School of Arts in Havana at age 18. Elmer`s extensive session work, recording and touring with Grammy winners and nominees as well as underground artists from all sorts of musical genre, made him soon be known as Cuba’s most sought after electric guitarist. Indeed, in a country with a reputation for great music, Ferrer has been one of the most prolific studio artists in the last decade. He has contributed to several award winning musical recordings, including the last five CDs and live DVD by Cuban megastars Juan Formell & Los Van Van. Elmer has also recorded a number of movie soundtracks including Wim Wender`s production Pio Leyva & the Sons of Buena Vista, and the acclaimed “El Beny”, based on the life of Cuban music legend Beny More. Elmer recorded Beny’s “original guitars” with direction of renowned Grammy awarded Cuban producer Juan Manuel Ceruto, whom frequently relied on Elmer for his recordings projects. Ferrer has performed at international music festivals worldwide, and played to crowds in excess of 90,000. He has played live shows or improvised jams with international stars like Me’Shell Ndegé Ocello, Ed Motta, the Otis Taylor Band, Chris Duarte, Los Lobos, Zucchero, and six time Grammy winner pianist Chucho Valdes. Valdes commented, “Elmer Ferrer is one of the best guitarists I have listened to in the last 30 years”.